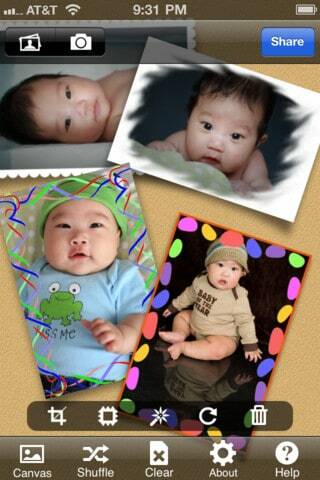 PicWall Plus, developed by Coldwave Technologies LLC, is an iphone app that allows you to put a number of images together in a single photograph, which is commonly called a photo collage. It’s nice that this app allows you to apply a wide range of filters and frames to each individual photo to create a polished collage. The UI is intuitive and easy to follow. When you open the PicWall Plus iphone App for the first time you will see some notes on a wood texture background. They pretty much explain all the things you need to know to get going. Tap the “Canvas” button on the lower left corner allows you to change the background. 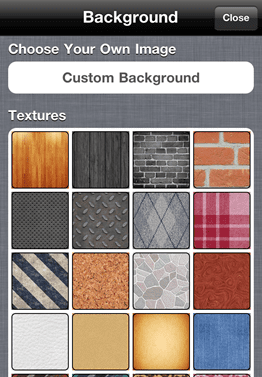 You can choose a texture image from the collection, or choose a photo from your album. I found the latter is particularly useful when you want to customize the background in your own way. Then you can tap the album icon on the top left corner to add images onto the background. When you single click a photo, a tool bar appears on the bottom, which includes the following operations that you can apply to the selected photo: crop, add frame, apply filter, reset position, and delete. The filters and frames are amazing, some of them are quite unique. My favorite is the cartoon filter, what it does is to flatten the color in the photo and add some dark strokes along edges to make the photo cartoonish. 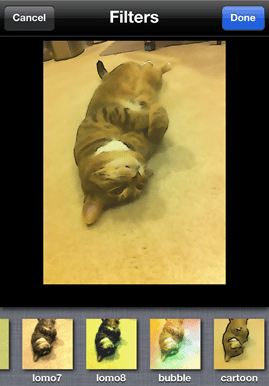 I know there are some apps that just do this, but in PicWall Plus it’s just one filter in the collection. When you are done you can save the photo in the local album, or email it, or share it on Facebook or Twitter. However the app currently doesn’t support saving the current work and loading it later, so you have to finish the current collage before you want to start another one. Overall this is a great app with a lot of functionalities. It is definitely worth the price tag: $0.99. You could get the app from itunes apps store here. What is the iPhone Ping App and What Does It Do?